"In my hope and my world vision, we’re all becoming anti-racist educators who are saying, 'I reject the system of supremacy,'" Sherita Love says. Photo by R.J. Hartbeck. Just one day before the United States would discuss the fairness of college entrance, Sherita Love sits in a pink chair, wearing all black except for the pops of blue from her matching necklace, earrings and bracelet. She’s at home in the colorful meeting room in 4220 Duncan, which houses a number of businesses and labs, the Innovation Hall lounge and several Venture Café St. Louis programs. It’s through Venture Café that Love became the manager of a new program designed to change regional education from within. But, to the surprise of some, students aren’t Love’s direct target. Instead, EdHub STL collaborates with educators at all grade levels along with parents and administrators to innovate new processes that bake equity into the region’s educational systems. The more support EdHub STL can provide to the adults who work within education, Love says, the better off students will be. “Our main focus is to support educators in hopes that students will benefit from the work that’s done,” Love says. EdHub STL manager Sherita Love chats with a colleague in the Innovation Hall coworking lounge at 4220 Duncan. This and top photo by R.J. Hartbeck. Love has been involved in the education space for more than 10 years, starting out as a teacher in a mostly-white school. There, despite feeling supported by the environment and the people around her, she experienced the problems that come with being one of a few black teachers surrounded by white-identifying educators and students. “The disparities existed just within that space,” Love adds. According to the US Department of Education, about 50 percent of the public-school education system consists of nonwhite students, while more than 80 percent of teachers are white. And without black teachers to look up to, black students are less likely to graduate from high school and pursue higher education. As a teacher, Love noticed that students of color often had limited help. When black students were struggling with school, she frequently was called upon to support them as well as her own students. Growing up in North St. Louis, however, Love experienced a different education system from her pupils — one that inspired her to become part of it. As a child, Love lived across the street from her elementary school, surrounded by black, female educators, which influenced her to see teachers as people to admire. School even became a focus for playtime, “Everything was about school. Everything. Our dolls were always in formation to learn!” she laughs. Sherita Love leads a hands-on session for educators. Photo by Chris Ryan. Love was only in the classroom for a few years before realizing it wasn’t for her. She moved into the nonprofit space to support educators by helping students in an afterschool program, realizing she could have a broader impact. 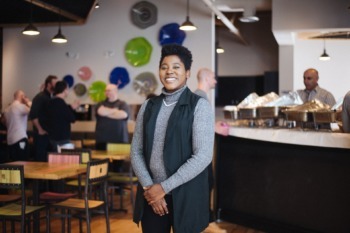 Later, Love also worked part-time as an event coordinator at Venture Café St. Louis, just as SkipNV, another organization dedicated to creating equity in education, purchased office space in CIC and began attending Venture Café’s Thursday Gathering. 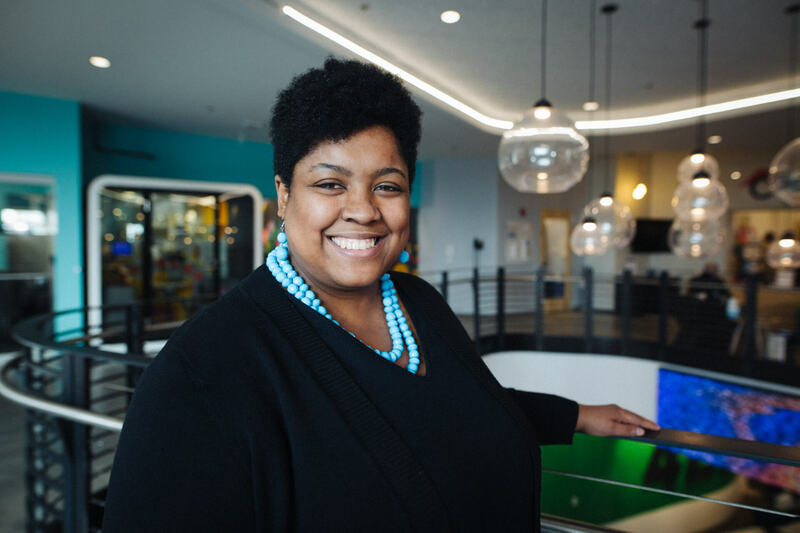 SkipNV’s team felt Venture Café could create an opportunity for educators to connect and innovate with one another, so they set up a meeting with Tyler Mathews, the executive director of Venture Café St. Louis, who led them to Love. “[It was] a true example of a serendipitous collision,” Love says. Someone on SkipNV’s team had already listened to Love’s podcast, ExpandED Conversations, so when they found out Love was an employee at Venture Café, they brought her into the fold. Love then recommended they employ the Forward Through Ferguson calls to action, which called for an education innovation hub. “It was perfectly aligned.” Love reflects. EdHub STL has a fellowship program that works one-on-one with 10 education “intrapreneurs” who have immersed themselves in transforming education around the St. Louis region. These fellows not only collaborate with each other and Love, but they also gain an office space in 4220 Duncan as well as additional funding for projects. They also partner with Washington University’s Social System Design Lab to understand how their initiatives affect education, how to recognize unintended consequences and how to add a lens of equity to their organizations. With such knowledge baked into their organizations, education systems around the St. Louis region might be able to take a new route; over the years, the Delmar Divide, the now-defunct desegregation program and the closing of 45 schools between 2005 and 2015 had affected thousands of students, most of which were in predominantly black neighborhoods. “Inequities in education have been fundamental to this country over centuries of time. It’s going to take centuries of time to repair the damage that has been created. We can’t attempt to make those repairs in those traditional ways,” Love notes. 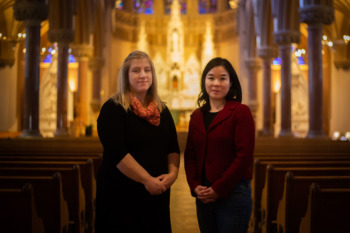 As a result, EdHub STL isn’t just a fellowship program. It also provides a neutral space for educators, parents and administrators to learn as a community free from judgment. Educators are leaders in the classroom, and Love encourages them to get involved in the next big thing for students. “In order for kids to feel safe enough to learn, grow and thrive, teachers have to feel that,” Love says. But while traditional professional development days are helpful, educators don’t always have the time and space to pursue new ideas without sacrificing their private lives. Moreover, they have to be aware that everything they do affects children. Education, Love says, was not originally created to be equitable — it was designed to make some kids more successful than others. And according to Love, it’s vital that educators not inflict that same harm on students today. “Knowing history, in my opinion, is very important in my work. So taking an anti-bias, anti-racist approach to education is critical,” she says. Love’s eyes begin to well with tears as she describes her recent sessions with teachers of color. She describes the work as ugly, heavy and deep, and the pain Love felt in and with those teachers reaffirmed her passion for contributing to equity in education. 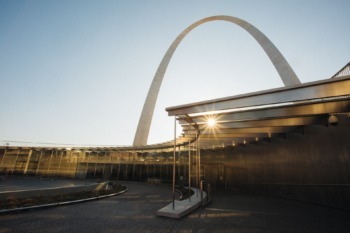 Love says that bringing educators in while EdHub STL was being developed was essential. “You have to do it with the people and not for the people,” she says. To work through issues together, the organization would host dinner and design sessions, where school leaders, parents and teachers talked about ideas that thrived and ideas to tear apart. Thanks in part to these initial sessions, Love has started receiving feedback from educators and other attendees about how therapeutic and inspiring the workshops have been. And EdHub STL fellows have shared how the space has legitimized them in the eyes of potential partners — some of them had been operating out of kitchens and coffee shops before gaining the fellowship and an office space. Her endeavor with the fellows has also helped them obtain sponsorships and partner with organizations like the Black Teacher Project. Love shares one example in which two educators from very different neighborhoods and financial standings collaborated to host a tech competition for their students, helping to break down barriers between these pupils as well as the stereotypes they might have had about one another. This connection among educators helps EdHub STL’s mission to ultimately serve what’s in the students’ best interests. “We can’t care for kids without caring for those who care for them,” Love says. Sign up for the EdHub STL newsletter to keep up with innovation in education. Follow EdHub STL on Facebook, Instagram and Twitter. Listen to Sherita Love’s “ExpandED Conversations” podcast.